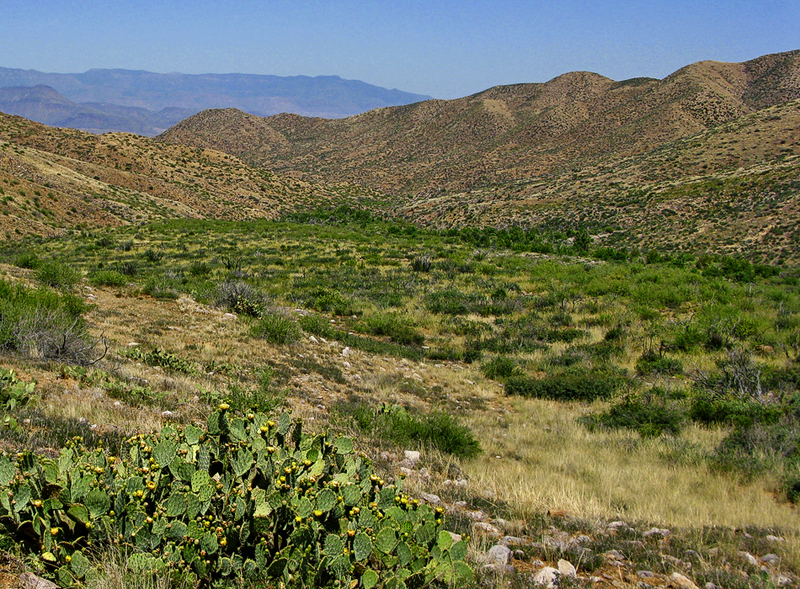 Rock Creek Trailhead (2850 ft) to the southern section of the Four Peaks Trail #130 (5725 ft) on the north-northwestern flank of Buckhorn Mountain. Rock Creek Trailhead sports some nice oaks right by a babbling creek. It's interesting to note that Saguaros are nearby at their upper elevation limit. The trail starts out as an old rocky road that quickly turns into a creek bed. The creek is seasonal. It flows better than expected after recent rains due to a large catch base. Hiking through the creek bed is the height of questionable route finding. Luckily it's easy to decipher and short lived. The quaint setting with trees is passed up in the first few strides. The hike enters a transitional zone of rolling hills. The area was wiped clean of vegetation by the 1996 Lone Fire. Now, twelve years later, there's barely a trace of fire. If you're on the lookout you'll spot areas that survived. The area can be quite photogenic albeit a tiresome stretch on a roller coaster of hills. Somehow the sun just seems to be radiating a little stronger in the area. I'd venture to guess few make it out of the rolling hills as it lacks visual luring hope. A small ridge is ascended at 2.0mi (3705 ft). I believe this used to be the old trailhead. 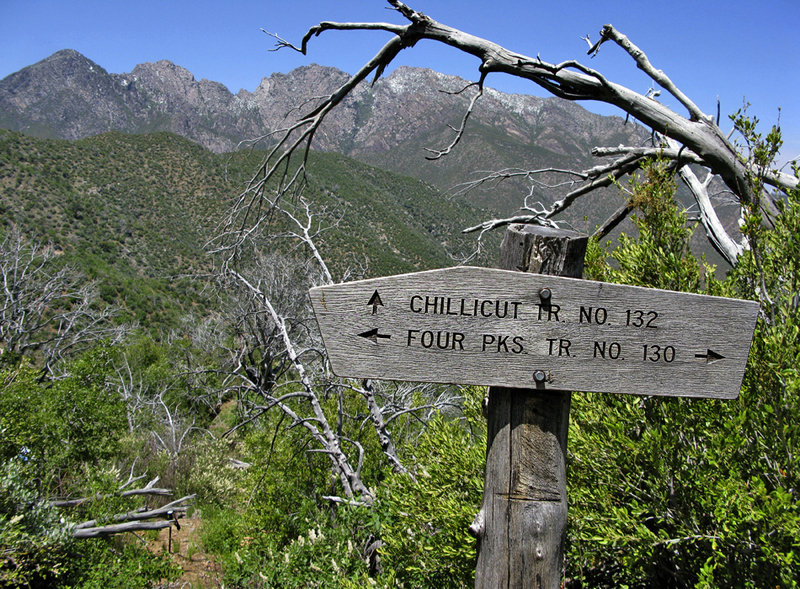 According to topo this is where the road ends and I believe were we saw a Chillicut sign. Continuing on you drop down into Baldy Canyon (3380 ft). In this lower section it's still pretty lifeless. You could make a lower loop here by following the creek back to the trailhead. 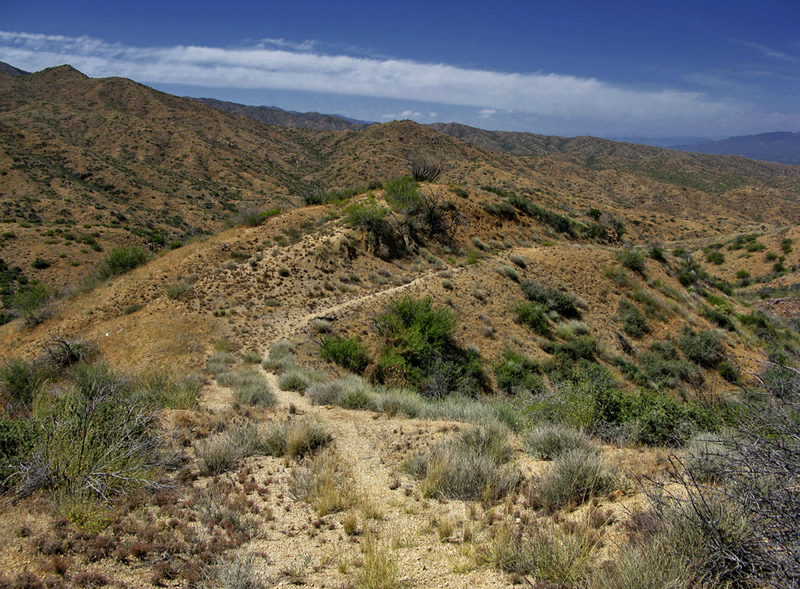 Within minutes you're out of the canyon and onto another ridge in a quarter mile (4145 ft). In short distance you top out above the creek (4400ft). Here you make the last short descent to the creek (4300 ft). I didn't see a sign but my mapping indicates this is near the Four Peaks Wilderness boundary. Here up things begin to change. It's a 1400ft mad dash up Baldy Canyon. Route finding requires a little more attention through several creek crossings but is well cairned or easily deciphered. Several of of the crossings consist of a 5-10 foot drop in loose footing. Within 5-10 minutes you cross a couple tributaries coming in from the west. Both were flowing on our trip. I should note this was an unusually wet year with rainfall in May (The driest month in Arizona beating June by a mere 0.01 hundredth of an inch based on PHX stats). The first drainage is fed by Dan Neal Spring, the second is fed by Black Bear Spring. However I believe the flow we saw was merely runoff from the recent rainfall. Your surroundings become more intriguing as you enter a riparian section. Here you'll find gnarly sycamores twisting about. Mammoth hand-sized canyon grape leaves on climbing vines. Having just been through the over roller coaster this is a real treat. I believe this is the nicest never mentioned gem of the wilderness. 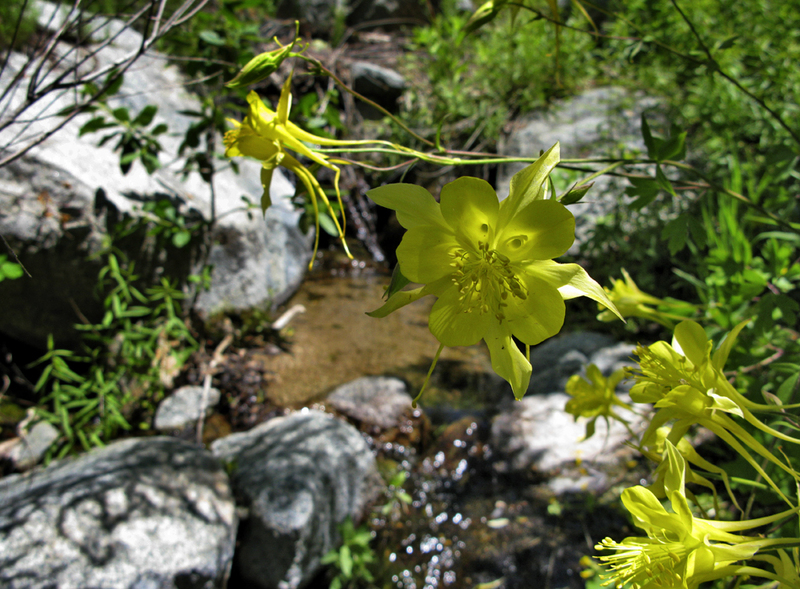 The habitat includes Yellow Columbine among other wildflowers. Beware though, poison ivy runs rampant through the area. The pleasant 13% grade gives way to a noticeably steeper 18% grade. 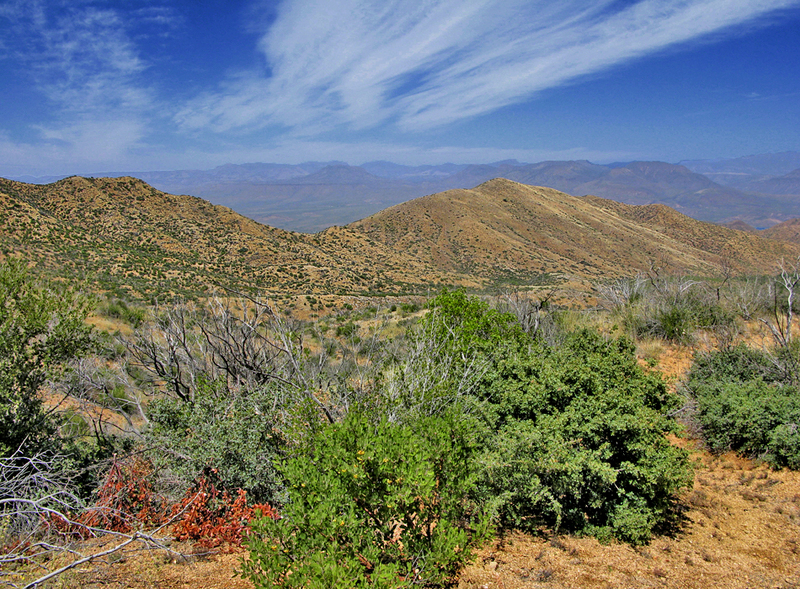 There's little time to complain before you're crawling off the last 33% grade to the Four Peaks Trail #130 junction. Trees populate the ascent offering shady rest options. This upper section has recently been maintained as of 2008. 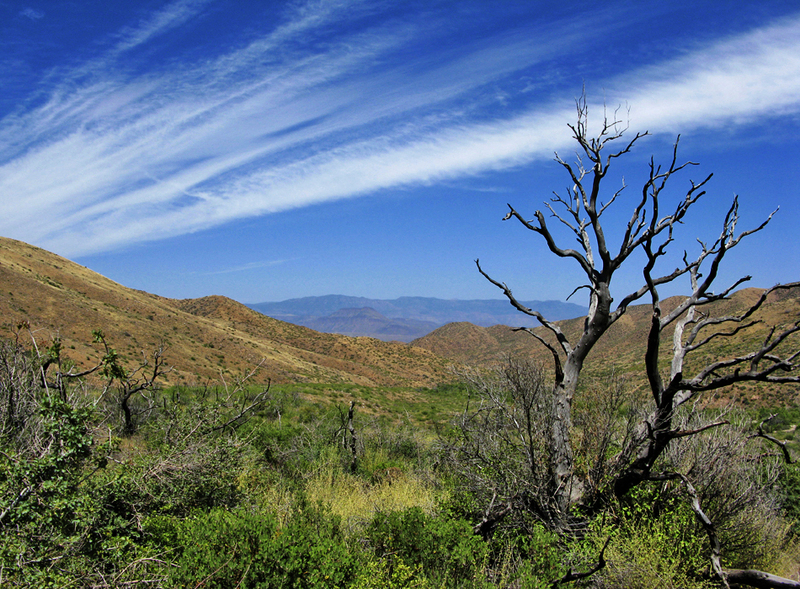 The end offers a rewarding view of the Four Peaks few ever see. I enjoyed this trail probably more then most. We did it as a counter clockwise shuttle with Oak Flat #123 & Four Peaks Trail #130. Which appears to be the optimal option. You could hike up to the riparian section as an out-n-back. However you'd miss out on the sweet Four Peaks transverse using the same amount of energy. From the corner of SR87 & SR188 head south on SR188 for 15.8mi to a right on 3 Bar Road. 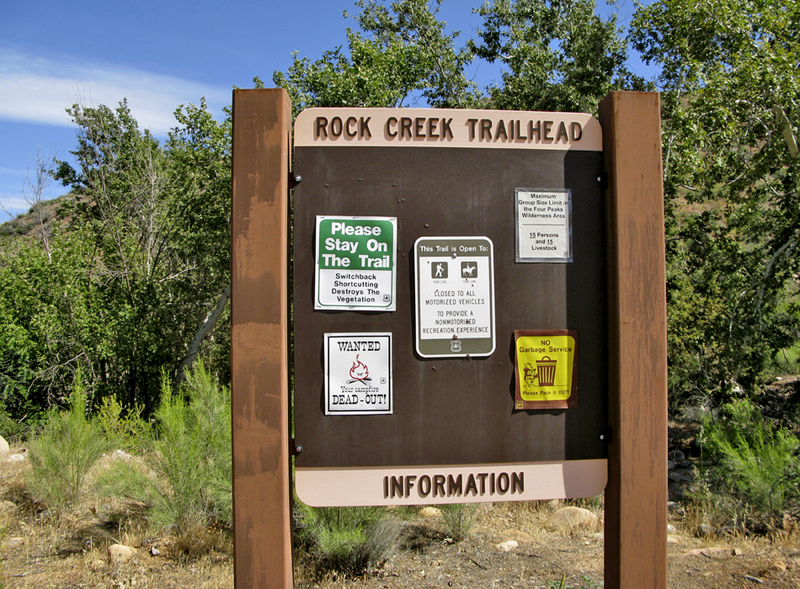 Follow 0.2mi to FR445 and continue 2.9mi to Rock Creek Trail. Left and 0.2mi to the Rock Creek Trailhead.